← Why all the trot work? 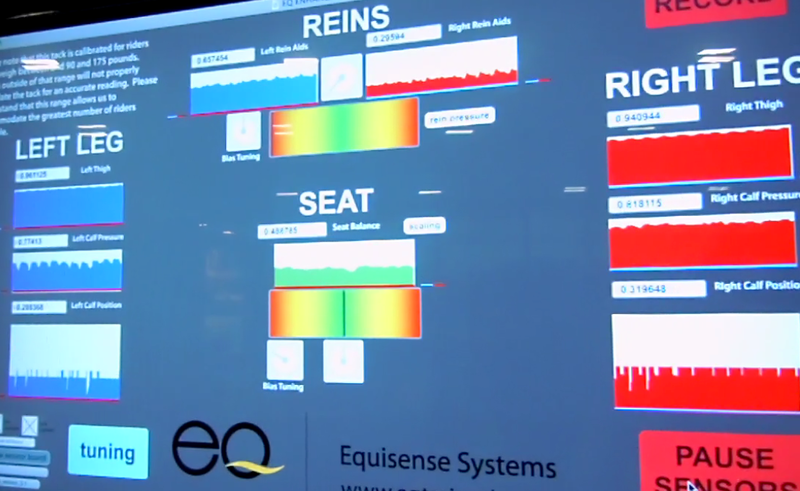 The Equisense sensors don't lie. 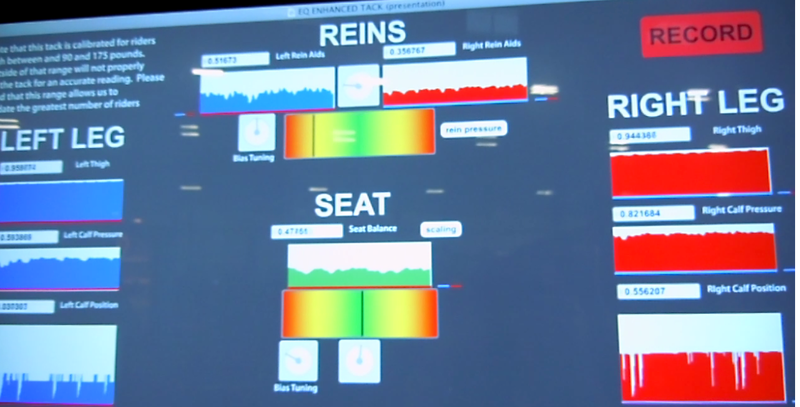 This weekend I had the opportunity to have my riding position analyzed using an Equicizer from Equisense systems. The Equicizer is endorsed byformer Olympian and general dressage goddess Jane Savoie, and is a sensor-loaded dummy horse that, when mounted, reveals how even (or not!) a rider’s position is. Everything from leg pressure to seat position to the weight one takes in the reins is measured and fed back to the rider. I will be the first to tell you that I have a variety of issues, so I eagerly clambered aboard for my session. And wow, it was revealing . Right off the bat, the Equisense trainer had me make a significant change to my seat – opening my hip flexors and changing my hip angle. I’ve been having some issues with my knees coming forward, and I had the same problems on the Equicizer. But after adjusting how I was sitting on the horse by opening my hip angle, the problem went away. At the outset, my seat was also slightly uneven. I was putting more weight on the right seatbone. The trainer instructed me to push my left hipbone toward the horse’s right ear. This adjustment balanced my seat perfectly. It didn’t feel perfect to me, however – it felt very much like I was pushing that left hip forward. The trainer advised me that my ability to feel this was good – to make this correction permanent, I’ll need to be aware when mounted, and start building the muscle memory needed to make this adjustment permanent. Happily, throughout my session on the Equicizer, I was able to maintain that balance, even through changes in the speed of the simulated gaits. Without a doubt, the most revealing part of the experience was what I learned about how I hold the reins. Right from the outset, I was holding a lot more weight in the left rein, even though they felt dead even to me. This is illustrated in the image at the top of the post – if you look at the top of the image, under “Reins” you can see that the red graph showing right rein pressure is far different from the corresponding blue graph for the left rein. The trainer worked with me on increasing and decreasing the degree of contact I carry in the reins from my shoulders, moving my shoulder blades back and forth. She then isolated my right arm and shoulder, asking me to bring that shoulder blade back. As I did so the sensors indicated that the pressure I was putting in each rein was almost even. She put the Equicizer into motion, and things went haywire again. Slowly I was able to even out the rein pressure. But it didn’t feel even to me – at all. Throughout the session, I was feeling more weight – a lot more – in that right rein. The muscle memory training mentioned previously will come into play here, as well. In the meantime, I owe a certain big bay mare an apology. Unbeknownst to me I’ve been really hanging on that left rein, even when things felt even or a bit light. In reality, I suspect there’s been a lot more pressure on that rein, and the mare has been responding as any horse would – by returning the favor, and hanging back. When I’ve managed to do the exercises Christy suggests (dropping pressure on the left rein intermittently while driving the mare into the right rein with my inside leg) we get the nicest, most honest bend. So the big take away here is to focus on evening up the balance in my reins, which *should* reduce the problems I’m having with left bend. Tonight, when I get back on the mare, I’ll have a specific plan. 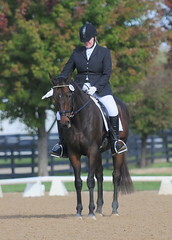 I’ll start by dropping my stirrups, paying attention to my hip angle and letting gravity stretch my legs. I’ll pick up my stirrups, and will maintain that open angle, avoiding my old posture with tilting pelvis and arched back. And when we’re working with what I perceive to be even contact, I’ll be conscious of reducing my left rein pressure, and observing that that change elicits in the big mare.